Personalizza la tua visita guidata facendo escursioni ai piedi della Baviera per optare per l'ammissione al castello, a tue spese. Tour guide Ben was very knowledgeable on the history of King Ludwig II and the castle. helpful too getting our group together. Excellent guy! It was a great trip. Tour guide is great and made everything Stress free. I would highly recommend!!! The trip was good, However you need to be able to walk up a steep hill to get there. you need to wear comfortable walking shoes. This trip to the castle was fantastic.! Well organized and no hardship.! The castle itself is amazing but what made the day was our guide “Hein” he was very informative and helpful but also he went the extra mile by making sure everyone was safe and didn’t miss trains or buses, he also was a great help after the trip telling us the best things to do in Munich.! 5 out of 5 for the castle.! But also 5/5 for Hein.! Our trip was really nice and the tour guide Thomas made it better. The place is amazingly beautiful. We were lucky to land there on a clear day and could clearly see the alps. La visita fue increíble. El castillo y el Alpsee merecen sin duda una visita. Los guias fueron muy atentos y amigables, además de contarnos datos interesantes en el camino. Completamente recomendable! I was surprised when I booked this trip expecting to go by train and instead went on a bus. I expected to get to the castle quicker since we were suppose to go by train. Luckily for us traffic was not that bad (sometimes traffic can be horrible) and we got there on time. This was the best decision I made since I was going to drive. Didn't have to worry about driving, parking, buying tickets,and possibly getting lost. I recommend this to everyone. magical! enjoyed very much. Our tour guide Aileen is brilliant. 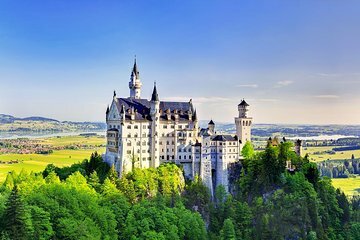 You really have to go to Neuschwanstein if you're in Munich. You just do. It's the model for Disney's Magic Kingdom, and even though I've never been to Disneyworld or Disneyland, I grew up with The Wonderful World of Disney on TV, which opened with a scene of their version of the castle. Short review: My sister and I agreed we wouldn't make a return trip, but we were glad we went the one time. It's a long 2 hour train ride from Munich and the castle really is quite impressive to look at - but there's not much to see once you're inside. On a positive note, that hike up and down the side of the mountain provided our day's workout. A BIG shout-out to our guide, Veronika Eckbauer ?. She was awesome - engaging, funny, and just overall fantastic. We wouldn't have enjoyed the trip half as much without her.